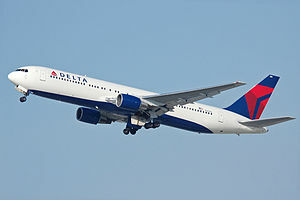 The Boeing 767 is an American mid tae lang-haul, mid tae lairge-size widebouk, twin-ingine jet airliner made bi Boeing Commercial Airplanes. ↑ "767 Model Summary (orders and deliveries)". Boeing. November 30, 2017. Retrieved December 28, 2017. ↑ 2.0 2.1 "Boeing Commercial Airplanes Jet Prices". Boeing. Archived frae the oreeginal on 2012-08-31. Retrieved August 8, 2012. This page wis last eeditit on 11 Februar 2018, at 20:39.